It’s February, the proverbial month of love and I find it almost obligatory to share my thoughts on what I believe love is; or what love is not. The word love is defined as a strong affection for another arising out of kinship or personal ties. This little four letter word has a wide variety of meanings and is commonly used in everyday language as a means of affection. Love I believe is a multi-faceted, ever changing, a push and pull kind of adventure that goes beyond romance. Love is in fact the root of life, the driving force behind friendships, those friendships that bring order and chaos to our lives; those friendships that along with romantic relationships define who we are, determine who we become and direct us on our life journey. The ancient Greeks have defined love in six ways. The idea, I believe, is that love cannot be restricted or defined as one thing or another. Love is ever changing; growing as well as diminishing at times. Love is scary but wonderful. Love is work, yet easy. Love is peculiar, strange, difficult and equally familiar and settling; maybe we should pay attention to the ancient Greeks. Eros love represents the idea of passion and desire. While being in romantic love is a wonderful element of life, I believe that the second type, Philia (or deep friendship) is just as important for a fulfilled life. Love between friends is essential. Life can’t be lived alone and while sometimes we find ourselves without romantic love, it’s that love of true friends that often carry us through struggles, holding our hands in times of trouble and celebrating with our hearts in times of joy. Can you count the number of Philia friends you have; those friends who love you just because they do? Do you have that select one or few who love you enough to not hold back, to tell you the truth even if it hurts a little? In a world filled with social media it seems that the higher number of friends we have on Facebook, Twitter, Instagram or some other social outlet the better. However, peeling back the layers I find that there are a mere few who deserve the title “Philia” loves in my world. Being able to count on one hand the number of true love centered friend relationships in my life proves to be just enough. Philia love I believe should be guarded carefully, not shared in a “willy nilly” kind of way rather nurtured, valued and held close to your heart. Ludus or playful love is often referred to the love between children, but can be between friends at a party or a dance. Agape love is defined as a love for everyone. Agape love is selfless, extended to everyone without condition or question. Agape love is just love. Author C.S. Lewis defined agape love and the highest form of Christian love or Christ like love. Couples in long standing relationships or marriages experience Pragma love, the longstanding love that provides stability, comfort and a sense of security. It is a familiar love, one that has stood the test of time and won. Ironically, the sixth and final type of love is Philaurtia or love of self. While at the bottom of the list this love is essential in order to love in other ways. Loving ourselves is important. Taking care of our physical and spiritual selves is essential in that it allows us to be our best. In order to be our best for others we must first be our best for ourselves. It is impossible to fully love others until we fully love ourselves. So what about love? Does love fill your life in various ways? No matter which type or how many types of love you have I encourage to take note of the love that you have; nurture it, appreciate it. As I write this week my heart aches a bit as life and love are experiencing growing pains. My firstborn began the process of sifting through the contents of her childhood room for things she wants to move with her into her new home; a home filled with love and promise. I realized that this love thing is changing and I also realize that it’s okay. I encourage you to reflect on the love you have in your life and cherish each stage. Love is an ever changing, ever challenging element of life that is both exciting and scary. Love is life’s embrace let it hold onto you tightly. I think we all need a touch point a place we can go to be inspired. Karla is my children’s teacher, a good friend, and a person with a heart of gold. I hope that her words will inspire you to do more. We are only as good as the people we surround ourselves with. It is important to listen with your heart and proceed with your eyes open. Enjoy! 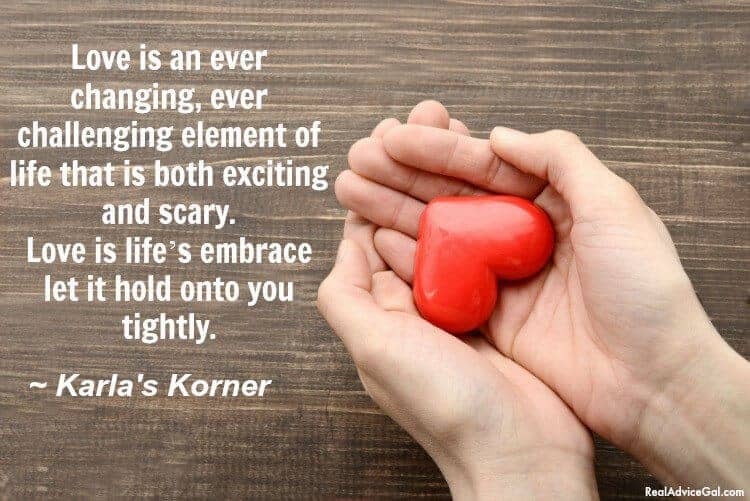 Read more Karla’s Korner, also please visit Karla’s Lifetime Moms page and read her articles. Check out Karla’s 24 Day Advocare Challenge! Find out how Karla transformed her life and lost over 80 lbs.. it all started with Advocare!